Ian Graham – whose book ‘Avoid being Sir Isaac Newton!’ Book House) was shortlisted for last year’s ALCS children’s non-fiction prize – has been writing for adults, too. He tells us: ‘My latest book for grown-ups is out – Scarlet Women – 430 pages, 100,000 hand-picked words about the scandalous lives of courtesans, concubines and royal mistresses from the ancient world to the present. 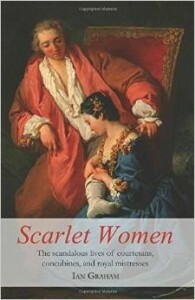 ‘Scarlet Women: The Scandalous Lives of Courtesans, Concubines and Royal Mistresses’ (just out – Thistle Publishing) follows Ian’s ‘The Ultimate Book of Impostors: Over 100 True Stories of the Greatest Phonies and Frauds’ (2013, also Thistle).